Side A: The love of Aphrodite and Phaon (see other image). Side B: The gods of Delos stand beside the sacred palm-tree of the shrine of Apollo. Leto, on the far left, wears a tiara-crown and holds a royal sceptre and palm-frond. 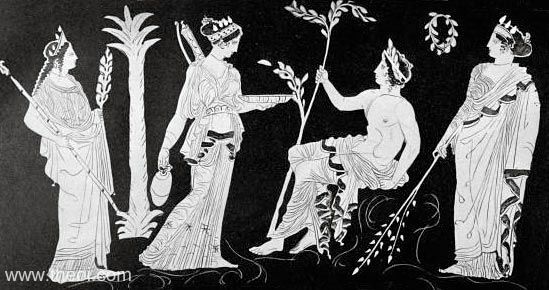 Artemis, standing beside her, is also crowned, wears a quiver, and holds an oinochoe jug and a plate. Apollo, who is seated on a rock, wears a wreath and holds a branch of laurel. Delos-Asteria, on the far right, is similarly crowned and bears a branch.